If I don’t have kale or spinach in my meals most weeks then I start to get withdrawal symptoms so this does the trick to satisfy the need even for diehard meat eaters as I’ve included spicy Italian sausage for good measure. This works well as a quick sauce or a baked gnocchi if you prefer so get stuck in! 1. If you want to bake the gnocchi then you need to preheat the oven to 200c/ 180fan at this stage. Take a large frying pan and add a glug of vegetable oil and gently soften the onion and garlic. Sprinkle in the chilli and rosemary sprigs and cook for a further minute or two. 2. Next up add in the sausage which should have had the skin removed. Break up with the spoon and cook for another few minutes. Next you need to pour in the passata and red wine vinegar and simmer this. Check the seasoning to taste as some Italian sausages can be better seasoned than others to start with. If you want to bake the gnocchi then disregard the next step and steam or boil the kale for a couple of minutes to start it off before mixing with the gnocchi and tomato base. It will take around 20 minutes in the oven and a topping of parmesan is also delicious. 3. Bring a large pan of water to the boil and cook the kale for 2- 3 minutes before adding the gnocchi to the pan. Cook the gnocchi for one minute less than the cooking time on the packet as you will finish them off in the pan. Drain the gnocchi and kale well. 4. 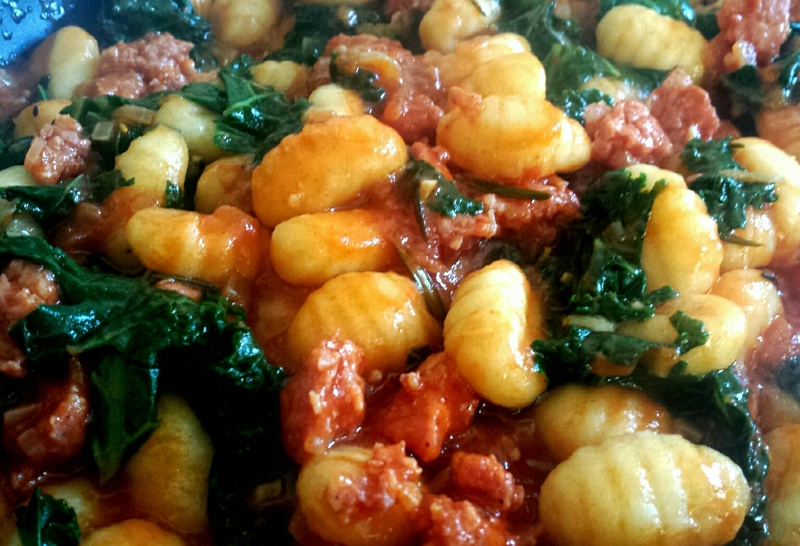 Tip the gnocchi and kale into the pan with the passata and simmer for a further minute or so. Serve in warmed bowls with a liberal shaving of parmesan if you like. Italian sausage and kale gnocchi- quick, easy and oh so delicious!